Henry was a rather unfortunate king, although his reign was one of the longest. Crowned at the age of nine in 1216, he inherited all the problems left behind by his father, King John. Matters eventually came to a head in the form of a civil war, and he was defeated at the Battle of Lewes in 1264 and imprisoned (together with his son, Edward) by Simon De Montfort, who took advantage of this opportunity by creating, in the King's name of course, the country's first fledgling Parliament. Edward managed to escape the following year, and together with the Earl of Gloucester defeated De Montfort and released Henry. Edward proceeded to rule in Henry's name until the old king died in 1272, at which point he became Edward 1st. 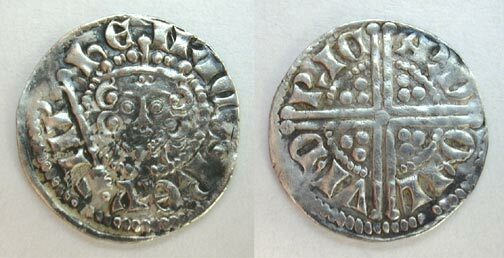 This coin is in unbelievably good condition, and looks as if it has only just been made. 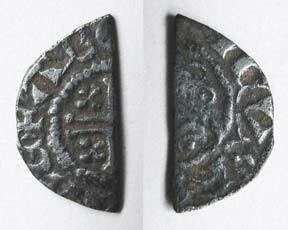 This could be either from the reign of Henry III or John, as the moneyer (Abel) worked in London for both of them.